The look of a material can be changed by adjusting its Modifiers. You can experiment as much as you wish with the settings – restarting ZBrush will return all the materials to their default states. 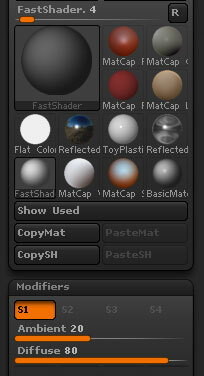 To access the Modifiers, click the Modifiers button in the Material palette. The Modifiers are grouped into one or more Shader channels and what’s available will vary depending on the material selected. Remember that some materials, such as fibers and those that use bump effects, only display correctly after a Best Render. To be sure these effects display when using BPR, do a Best render first.